Everyone loves a good mystery. Gathering evidence and piecing together clues is exciting! The same is true for science and reading when lessons are presented within the context of finding clues and drawing conclusions. In this issue, we explore how to use fossils and artifacts (scientific clues) to learn about the polar regions' past. Learn about polar dinosaurs, fossil formation, and how KWL charts can support evidence-based reasoning. Use the lessons to help your students learn about fossils, make inferences, and use context clues to define new vocabulary. In this game of "clue," everyone wins! 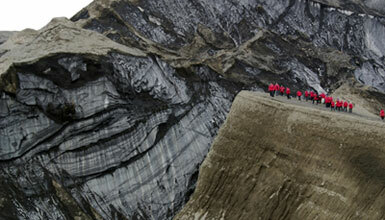 Photo: Mouth of a volcanic cone with layers of ice and ash on Deception Island in the South Shetlands, Antarctica. Photo courtesy of Sue Sheridan.